I registered to the second edition of the Asheville Marathon being held in Asheville, North Carolina on March, 16 2014. The registration fees were $135 and includes a bag of goddies, post race food and a Sierra Nevada beer. You can also stay on the property during the day. 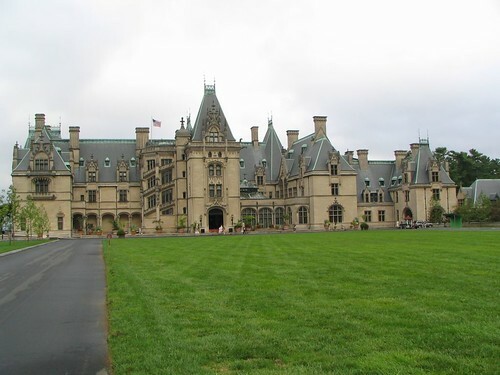 The race go over the Biltmore e-state and let you discover this nice property over 13.1 or 26.2 miles. The race was sold out! Due to some restrictions (probably defined by parking capacity, restrictions from the property owners, etc. ), the race was limited to 1400 runners: 800 of them did the half-marathon and 600 others signed up for the full. Packer pick up took place at a hotel nearby Asheville. The packet includes some Cliff bars, an official shirt and a ticket to enter the property on race day. It also includes a bag you can use at the drop bag location before starting the race. Parking on the property was quick and easy. It took 20 minutes to go from the entrance of the property to the race start. The parking is 5 minutes walking to the race start – very convenient. If you do not want to drive, a shuttle starts from the accommodations recommended by the Hotel and brings you directly to race start. The race starts at 0730am and everything was on time and pretty well organized. The route starts with a nice small hill. At mile 5/6, you will see the Biltmore house (see below) and run around the garden. Then, the race continues on unpaved road. Unfortunately, the weather was not very cooperative on that day so that some roads were pretty muddy. On the other hand, you cannot control the weather and I did not bother me at all and had a great time. On the overall, the race was beautiful and I really enjoyed it so far! The main complain I would have is the back-to-back track: the course pass by the same point several times, which is really unfortunate considering this size of the property and the potential other paths we could take (for interested readers, you can check the route tracked by my GPS to get an idea of the back to back paths)! Which brings another issue about race certification: there is nobody to check that you are doing the back-to-back path so that people can cheat and just not do this part of the race! While I enjoyed it, some guys that are looking for a Boston Qualifier time might cheat. There are also other way to cheat: before the finish line, you have to make a turn to complete the last 6.2 miles and nobody checked if you are turning or not. While this is not a problem at all for me, this might be unfair for people trying to get a certified time. The water stops were really well organized you have many opportunity to get water or food so that you do not need to carry your own water, which is very convenient. The stops have water, gatorade and even regular coke! Food included gels, cliff bars, banana, orange and (sometimes) cookies. Nothing to say and everything was well organized and I never had to request or wait for anything! Upon completion, you get a nice blanket, some drinks (water/enhanced protein drink) and you can go to the food tent to refuel. There was no wait at all and everything was pretty well organized. It was also possible to check your time just after you finished the race! Also, parking was not crowded at all and it was easy to exit the property. Mostly unpaved roads, no pollution from other vehicles! If you are looking for a nice race over a beautiful property, the Asheville marathon can be your next race! Easy (not so many hills and they are not though at all), beautiful with plenty of water stops, this is a very good experience! Unfortunately, the back to back paths make this nice journey repetitive because you see the same spots several times. If the weather is not cooperative, you will also end up by taking some very muddy road, which is very unfortunate considering this beautiful area! It would be great if the race can take place later (one or two weeks …) to increase the chance of having a nice and sunny day. In other words, I do not regret at all this experience and I enjoyed it so far. I would probably not do it again – not because of the race itself but because I would like to discover other races in other states. If this would be next to me, I would consider to do it again! But if you want to discover what Biltmore looks like and enjoy a nice Sunday run, this race is for you!